Ribbons have been used to express solidarity on the part of the wearer with the identified cause since the early to late 20th Century. Pink Ribbons (and the color pink) are used to express support for those who are diagnosed with breast cancer and the pink ribbon is now an international symbol of breast cancer awareness. 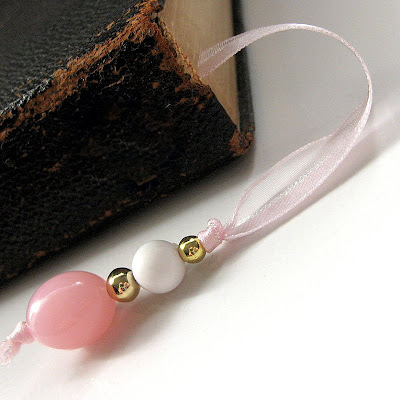 In this bookmark, a sheer length of pink ribbon with shimmering iridescent center threads makes up the body of this beautiful beaded bookmark with pink and gold-toned beads at the ends. The bookmark is 16.25-inch (41.3 cm) long from tip to tip. This bookmark, like all of our bookmarks, is sure to mark your place with your own personal style without damaging book's pages by the commonly used corner-folding methods.